The clients for this small bathroom project are passionate art enthusiasts and asked the architects to create a space based on the work of one of their favorite abstract painters, Piet Mondrian. Mondrian was a Dutch artist associated with the De Stijl movement which reduced designs down to basic rectilinear forms and primary colors within a grid. Alloy used floor to ceiling recycled glass tiles to re-interpret Mondrian's compositions, using blocks of color in a white grid of tile to delineate space and the functions within the small room. A red block of color is recessed and becomes a niche, a blue block is a shower seat, a yellow rectangle connects shower fixtures with the drain. The bathroom also has many aging-in-place design components which were a priority for the clients. There is a zero clearance entrance to the shower. We widened the doorway for greater accessibility and installed a pocket door to save space. ADA compliant grab bars were located to compliment the tile composition. Highlight functional areas. 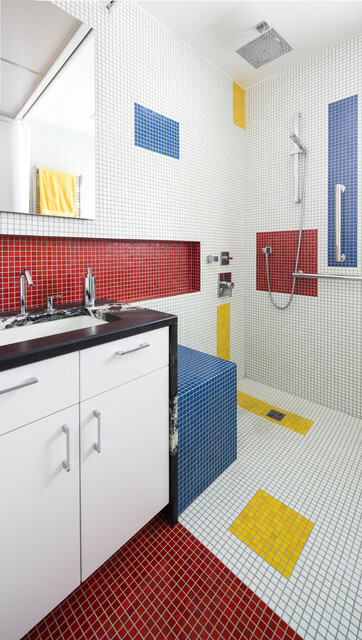 The clients for this small bathroom project asked Alloy Workshop to create a space based on the work of one of their favorite abstract painters: Mondrian! Not only does the bathroom resemble the artist’s work, but it channels the modernist tenet “form follows function.” This means the shape of something should be based on its use. Here, there are colored tile fields at many functional locations.The red above the sink delineates a shallow inset shelf. Blue tile covers a shower seat and surrounds a grab bar on the wall. The yellow stripe depicts the shower controls and drain. looks like legos. color scheme and furniture design. Here’s a concept! Would match upstairs bathroom. always nice to see something completely different on houzz. very mondrian.